The FMOC (Federal Reserve’s Open Market Committee) met for the 7th time this year, with the final meeting of the year scheduled for December 16- 17th. As expected, they announced that QE3 would be ending at the end of October. The Quantitative Easing policy was an asset purchasing tool to keep interest rates at historically low levels. The Fed had been reducing the amount of MBS (mortgage- backed securities) purchases by $10 billion a month from a high of $85 billion. The final $15 billion will end in October. The termination of QE3 was justified by the Fed’s statement that t U.S. economic activity is expanding at a "moderate pace" since the Committee's last meeting on September 17. "The Committee anticipates, based on its current assessment, that it likely will be appropriate to maintain the zero to one-fourth percent target range for the federal funds rate for a considerable time following the end of its asset purchase program (QE3) this month, especially if projected inflation continues to run below the Committee's 2 percent longer-run goal, and provided that longer-term inflation expectations remain well anchored," the Committee's statement said. Most people believe the Fed will keep rates low for at least another 6 months. The CFPB has finalized a modification to the QM rules pertaining to the 3% points and fees calculation. They now will permit the Lender to reimburse the borrower any funds to cure an error that made a loan exceed the “points and fees” test within 210 days of closing. That permits the lender to keep the QM status for that loan. The Bureau has stated that Lenders have been putting a buffer in the 3% points and fees calculation (such as allowing only 2.5%) to allow for any miscalculations that may throw the loan into a non-QM status. This modification will incentivize the Lender to remove the buffers and provide greater access to responsible and affordable lending for its customers. 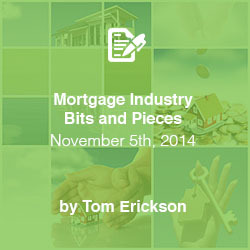 Mortech's mortgage pricing engine has automated QM and compliance checks built in. Find the perfect online lending, mortgage pricing, and secondary marketing solution for your business here.